David Turner’s spine and back issues cause him nearly constant pain and distress, keeping him inside his house most days and unable to meet with clients for his web design business or care for his two children. A medical test would clear Turner for steroid shots to lessen the pain, but the $5,000 price tag is too steep for the Gaston County family with an annual income of less than $20,000 and no health insurance. The Turners are stuck in what’s known as the Medicaid expansion gap, a hole created when North Carolina’s legislature rejected federal money that would have expanded the program to cover a half-million of the state’s lowest-income adults. 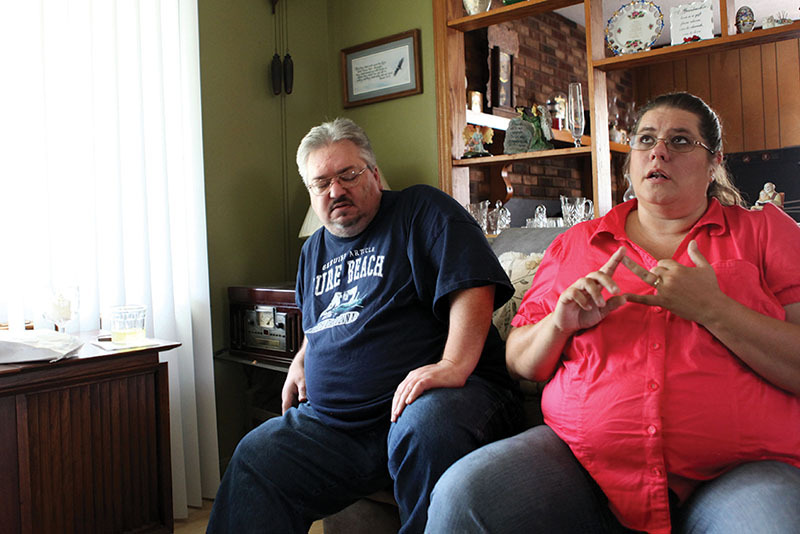 “We’re hanging on by a thread,” said Karen Turner, who has diabetes but delayed treatment so the family can afford her husband’s pain medications. If David Turner had access to medical care, there’s a good likelihood that he would be able to work more, earn more, pay more taxes and better support his family. North Carolina is one of 20 states that has not expanded its Medicaid program to cover poor adults, even though the federal government would cover most of the costs. North Carolina accounts for 10 percent of all the nation’s adults that fall into the Medicaid gap, according to the Kaiser Family Foundation. A central element in the five-year reign of conservatives has been a fundamental change in how state government views and treats its poorest and most vulnerable citizens. The 2013 decision to reject Medicaid expansion is part of a broad effort to cut, limit or eliminate programs that provide ladders to help poor families climb out of poverty and find better futures. 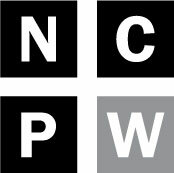 There’s not a single program that can eradicate poverty, making it all the more important to maintain strong public education systems, adequate housing, access to child care and health care as well as strong safety nets to provide food and shelter in emergency situations, said Elizabeth Lower-Basch of the Center for Law and Social Policy, a national advocacy group for low-income people. In North Carolina, more than 17 percent of residents live in households with annual incomes below the federal poverty line, roughly $24,000 for a family of four. Many of those at the bottom are children; census data released in October showed that nearly one in four North Carolina children live in impoverished households. Nearly 40 percent of black and Latino children live in households classified as impoverished. In the Gaston County community of Bessemer City, the Turners are waiting for Karen’s anticipated 2017 graduation with a community college degree in medical office administration. The hope is that she can find a job that provides insurance for the family. Meanwhile, they’ve looked into temporarily moving to a state that has expanded Medicaid or traveling to Mexico to get spinal surgery for David, but they have concluded that neither option is feasible. “We’re stuck,” David Turner said. After a medical scare Karen Turner had this fall, the couple opted to divert their limited funds from paying for David’s medicines and instead begin treating his wife’s diabetes. Advocates of limited government contend that the policy changes and spending cuts enacted by the legislature are long-overdue measures to reduce the size of state government, cut taxes to individuals and businesses and stimulate the economy. Others disagree. Critics say decisions like the refusal to expand Medicaid are cruel and unnecessary, especially with the state’s slow recovery from the national recession. Barber, a pastor of a Goldsboro church who has led the civil rights organization for the last decade, is one of the most outspoken critics of decisions by the legislature. He is the leader of the Moral Monday protests that gained national attention in 2013 with weekly displays of civil disobedience. When the Democrats were in power, they too did not do enough to help the poorest citizens, Barber said. And those in power now, he said, show little regard for the struggles that working and low-income people face. Gene Nichol, a UNC law professor studying the effects of poverty, is blunter. North Carolina was once seen as a state that managed to dodge the worst of the South’s widespread poverty, in large part because of a commitment from state leaders to building a strong public education and infrastructure system. But the state was hit hard by the Great Recession. In 2008, more than 16 percent of the population lived in poverty in 47 of the state’s 100 counties, according to U.S. Census figures. By 2013, that was the case in 79 counties. The spending cuts – in public education, health and human services – are especially deep, because they come on top of reductions forced by the recession. The earlier cuts, enacted by Democrats then in control of the legislature and the governor’s office, came in response to the plunge in tax revenue from business and income taxes caused by the economic collapse. But the decisions made after the 2010 shift in power amplified and deepened many of those cuts. An accompanying overhaul of the tax structure broadened the sales and other taxes that the N.C. Budget & Tax Center says are disproportionately paid by low- and middle-income residents and flattened an income tax structure largely to the benefit of businesses and wealthier residents. The decisions range from those that affect many — such as the 500,000 residents not eligible for Medicaid — to smaller programs, like the elimination of dozens of state dental hygienists who visited schools to check on the teeth of children. In 2006, the state Oral Health Department in the N.C. Department of Health and Human Services had 84 people on its staff. Less than a decade later, that number is down to 36. Many of those let go were dental hygienists who provided examinations at elementary schools throughout the state and then helped coordinate care for children whose families couldn’t afford regular dental care. The cuts leave 35 counties without the dental services. Tom Vitaglione, a senior fellow with the child advocacy group N.C. Child, said the state had been making progress in reducing infant mortality, building up early education programs and increasing high school graduation rates. In fact, the N.C. Department of Health and Human Services announced in October that the infant mortality rate rose slightly to 7.1 deaths for every 1,000 births, well above the national rate of 6.0. For black children, the infant mortality rates are more than twice that of white babies. Many other programs affecting the poor have been scaled back or eliminated over the last five years. North Carolina was the only state in the nation to get rid of its Earned Income Tax Credit, affecting nearly one million poor, working households that used to receive an average $119 tax refund. The state’s lauded pre-K program for low-income children will serve 6,476 fewer children in 2016 than it did in 2009. Advocates for the elderly say a failure to increase spending for nutrition and health care programs has left many of the state’s senior residents in compromising and potentially dangerous situations. The programs that keep elderly people healthy and independent – allowing for visits from home aides, meal delivery or daily community meals at senior centers – can be the first to go when spending gets tight. Some of the spending decisions were forced by the recession. As the economy has begun to recover and tax revenue has risen, however, legislative leaders have maintained a tight lid on spending. A $400 million surplus in the last budget year was not used to significantly shore up the public schools or restore cuts to many of the programs affecting the elderly, indigent and poor children around the state. Instead, some money was placed in a rainy day fund and another round of tax cuts was provided for businesses. The lowered benefits have pushed some people into a downward spiral difficult to shake off. Ramona Aragon of Durham lost her job as an administrative assistant in March. It was the first time she’d ever been laid off, and she immediately applied for unemployment benefits while she looked for new work. But 15 weeks went by without her application being processed, and, with her savings depleted, she had to sell her belongings and move back into her parents’ home with her two children, 13 and 7. Even if the unemployment benefits had come through when they were supposed to, Aragon said it’s unlikely it would have saved her. She had been making $600 a week, and the unemployment help was a fraction of that. “I truly don’t know anybody who could live off of $240 a week,” she said. The father of her children is not in the picture and owes her more than $35,000 in child support. For a while, she took a job as a waitress, but had to quit when she was unable to arrange child care. Unpaid bills have destroyed her credit record, and she now thinks her poor credit scores have kept her from getting jobs at several financial services firms. Aragon, who had been working toward a nursing degree before she was laid off, is now enrolled in a training program at Durham Technical Community College to prepare her for work in the pharmaceutical industry. She hopes that once she finishes the program later this year, a job will materialize and she can earn enough to move her and her children out of her parents’ house and start rebuilding their life. “It’s been hard on all of us,” Aragon said. Child care subsidies, designed to make it possible for low-income parents to go to work, have also come under the knife. 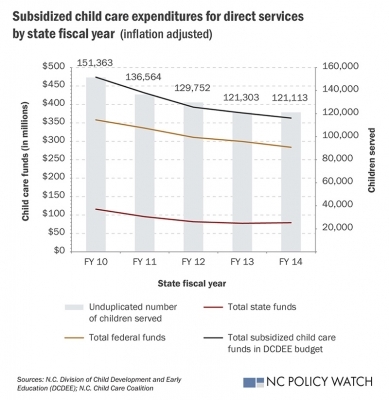 The legislature narrowed the income eligibility for families that could get help, and about 6,000 children lost their places in day care as a result, said Michele Rivest, the executive director for North Carolina’s Child Care Coalition. 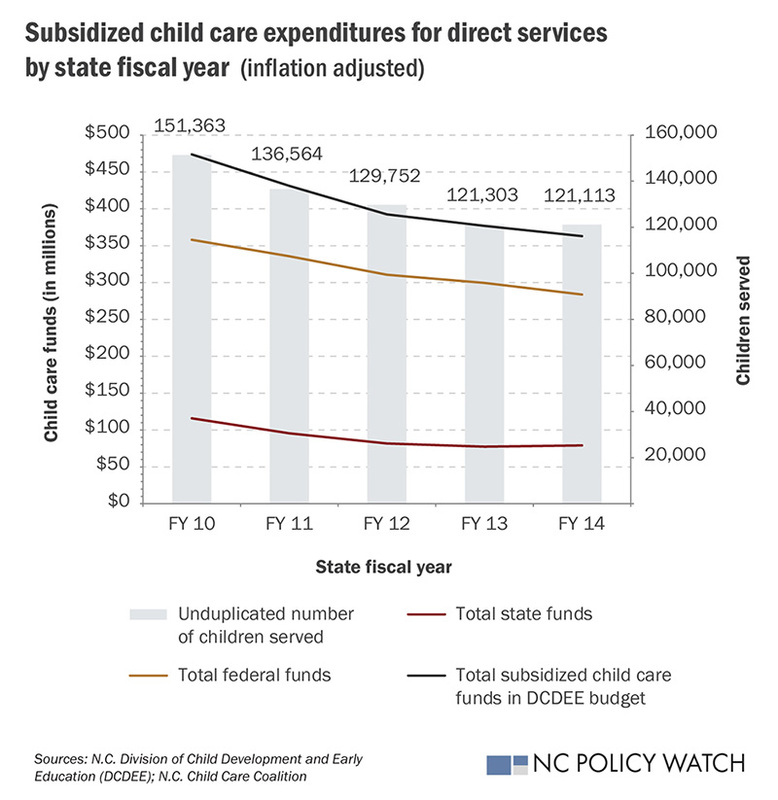 NC Child’s Rob Thompson discusses the decline in public investments in child care and education since conservatives gained control of North Carolina’s legislature. The income-eligibility changes came in the midst of general drops in funding and changes in reimbursement rates that led the state to provide child care help for 30,250 fewer children in 2014 than it did in 2010. “I have no understanding of why that happened,” Rivest said, other than a “general thing about decreasing the size of government.” What happened to the affected families is unclear, she said, because no effort is made to track the results of the policy changes. Those working in the field say the usual alternatives are that parents have to quit their jobs, children are cared for by neighbors or family members, or the children are left to fend for themselves in empty homes after school. Donna Pyles owns a Fayetteville area child care center where multiple families withdrew their children after income eligibility was increased. She too worries about what becomes of those families, many of them headed by single mothers, and whether their children are in safe settings or getting the developmental help they need. Changes to the child care subsidy program had an immediate and disastrous result for Calla Caristo, a single mother of three earning $16.50 an hour as a receptionist at an Asheville real estate firm. Late this summer, Caristo learned that her two elementary school-aged children would no longer qualify for after-school assistance, and the co-pay for her 3-year-old’s child care would go up by $100 a month, enough to put it out of reach. Caristo had to quit her job to care for her children. She had been living with her brother and his family, but tensions rose in the house as he faced foreclosure and financial issues of his own, and she moved out in September. She doesn’t know where she’ll end up and said she takes each day as it comes to find money for meals that often end up being peanut butter sandwiches. The family spends some nights at a friend’s house and many others parked at city parks. She tells her children they can see the stars through the car’s sunroof, something most kids don’t get to do. Caristo wishes someone had stopped and thought about families like hers before putting the changes in place.